The 2 to 5' Rollback Personalized Pinewood Glider provides a calming way to enjoy the outdoors and rid yourself of tension with this sturdy and comfortable glider. Select from our 2, 4, and 5 foot wide models. The 4' and 5' glider are pictured on this page. 16 ball bearing for smooth gliding. Assembled under pressure ensuring rigid suspension. A garden can never have too many roses, and this glider lets you add even more. Cushions are manufactured from Sunbrella material which is designed especially for outdoor use. A center table with cup holders is available for 5' and up sizes. 2' glider - 32 x 27 x 35"
4' glider - 52 x 27 x 35"
5' glider - 64 x 27 x 35"
6' glider - 76 x 27 x 35"
Take comfort to the great outdoors with a poly vinyl swivel glider. 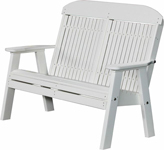 Designed with relaxation in mind, this Adirondack glider has strategic curves, and the poly lumber requires minimal maintenance. Outdoor relaxation is more than a dream with this swivel glider. The glider uses attractive vertical slats and a chair top so you can relax your whole back. The easy care poly vinyl is relaxing even after you get up. Available in Aromatic Red Cedar, milled for a smooth finish. Also available with outdoor sealer for an additional cost. This bench's practical design looks and feels modern. The low maintenance poly vinyl material is practical, too. 16 ball bearing for smooth gliding action.